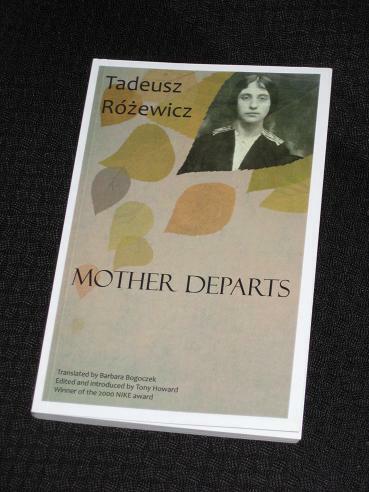 Tadeusz Różewicz’s Mother Departs (translated by Barbara Bogoczek, review copy courtesy of the publisher) is a short book, encompassing several different styles of writing. There are some childhood reminiscences, short poems, diary entries, prose fragments… a bit of everything really. When we know what happened to Janusz (and the excellent introduction gives a detailed account of Różewicz’s family history), the poems take on a more solemn, personal tinge. “It was not until my brother and I crept into the creaking bed and hid our heads under the thick eiderdown that we dared speak out loud. We prayed for a miracle. The collection ends with contributions from Tadeusz’s two brothers. Janusz’s piece is a fragment from a man whose life was cut tragically short, a short description of coming home from school to his waiting mother. Stanisław’s is a childhood memoir, again with a central focus on his mother. Together, the assorted texts form both a portrait of, and a homage to, a woman – but also to a country and a time. You see, as much as it talks about Stefania, Mother Departs talks to the reader about a shared past. It’s easy to see why it won the Nike Prize – it’s not so much the private memories of a mother, as a collective, nostalgic look at what has been lost.